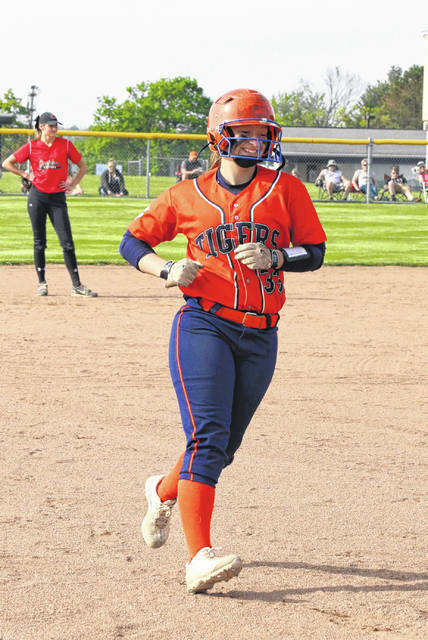 LEXINGTON — Galion won it’s first district softball championship in at least 35 years, according to Galion superintendent Jim Grubbs, with a 4-1 win over Crestview on Thursday in Division III tournament action at Lexington. It’s now off to the District III, Findlay regional semifinals for Galion. They will travel to Findlay High School on Wednesday, May 25 to play the winner of Friday’s game between Cardington and Utica. First pitch is 5 p.m. on Wednesday. Galion received stellar pitching, great fielding and clutch hitting to oust the Lady Cougars. Leading off for Crestview was center fielder Autumn Bailey, who delivered a single on the first pitch of the game. She stole second base on the second pitch. Natalie Restille would advance Bailey on a fielder’s choice up the middle to Galion starting pitcher Madelyn Thomas. With a runner at third, Cougars’ pitcher Kennedy Hickey stepped up to the plate and belted a deep fly ball to Maddy Harmon in left field, scoring Bailey. Looking to keep the rally going, Claire Roberston ripped a double into left-center and then went to third on a passed ball. Thomas and Galion would get out of the inning though as Kylie Ringer went down on strikes. Galion didn’t get a baserunner in the bottom of the inning. In the second inning, Caitlynn Frontz doubled on the second pitch that she saw from Thomas. After a walk to Paige Schaefer, Reegan Givens laid down a sacrifice bunt to advance Frontz to third and Schaefer to second. Kaitlyn Hunt went down on strikes and Bailey grounded out to Schieber at third to end the inning. Thomas walked with two outs in the bottom of the inning, went to second on a passed ball but would be stranded there as Maddy Harmon went down on strikes to end the inning. Crestview had runners at second and third in the third inning, but couldn’t score. In the home-half of the third, the Lady Tigers’ bats came alive. With one out, Alaina Sparks walked. Kaple stepped in and earned Galion’s first hit with a single to put runners at first and third. Schieber got the Tigers on the board by scoring Sparks on a sacrifice fly. In stepped Clark and, with a full count, ripped a two-run home run over the left field fence to give the Lady Tigers a 3-1 lead. Thomas struck out two in the top of the fourth and sent the Lady Cougars down in order. With two outs in the bottom of the inning, Caudill singled for Galion, and Sparks was be hit by a pitch, putting Galion runners at first and second. Kaple ripped her second single in two innings, plating Caudill and putting the Tigers up 4-1. Throughout the remainder of the contest, Thomas was lights out in the circle. She allowed just three baserunners in the final three innings: two singles and a hit batter. She went on to earn four additional strikeouts, including three in the sixth. For Crestview, Hickey would strikeout the side in the fifth and allow just one more hit, a single to Caudill in the bottom of the sixth. Thomas earned her second victory in two days, going the entire seven innings, allowing just the one run on seven Crestview hits, walking a lone batter and fanning nine. Hickey took the loss for the Lady Cougars, going six innings, giving up six hits and four earned runs while walking two and striking out 11. In her two games in the district tournament, Hickey recorded 25 total strikeouts. LEXINGTON — In Wednesday’s semifinal, No. 4 seeded Galion Tigers beat the top seed from Clear Fork, 6-5. Both teams got off to a slow start, as they combined for just four hits — two singles apiece — through the first three innings of play. Still, the Lady Tigers got out to a 1-0 advantage in the first. Kaple led off with a walk and moved to second on Schieber’s sacrifice bunt. A groundout to Clear Fork third baseman Hallie Gottfried put Kaple at third with two outs. Sedmak singled in Kaple but would be stranded at first following a flyout by Gracie Groves to Macy Wade at second. In the top of the second, Caudill singled for Galion with two outs, but never made it past first as Sparks grounded out to Colts’ pitcher Maddy Wine to end the frame. In the bottom of the second, Clear Fork shortstop Courtney Palmer delivered a single, but the Colts went down in order following that. In the visitors’ half of the third, Schieber was hit by a pitch, went to second on a fielder’s choice but was stranded there. Clear Fork went in order in the bottom of the third. Groves would lead off for Galion in the fourth with a single. After a passed ball and a single by Thomas, Galion scored on an RBI bunt single by Harmon to go up 2-0. But the Lady Tigers were far from finished in the inning. Caudill reached on a fielder’s choice and following a pitching change and a groundout by Sparks, Kaple stepped in with two runners on. She cleared the bases, delivering a two-RBI double to put Galion up 4-0. Kaple stole third base and Schieber walked, then stole second and the Tigers were threatening again. In stepped Clark, who cleared the bases with a single scoring Kaple and Schieber to give Galion a hefty 6-0 lead. Clear Fork’s offense also came alive in the fourth, beginning with a lead-off single by Carson Crowner. A walk to Haylie Miller followed to put two runners on for Wade, who ripped a two-run double to put the Colts on the board. Palmer stepped in and delivered an infield single to put runners at the corners with no outs. A passed ball scored Wade and moved Palmer to second. Another passed ball put Palmer at third, still with no outs. But Thomas fanned Reagan Marshall before Gottfried grounded out to Caudill at second. Gottfried earned an RBI on the out by plating Palmer as Clear Fork trimmed Galion’s lead to 6-4. Both teams would go quietly in the fifth as the Colts managed just a single by Zara Thomas in the bottom of the frame. Galion went down in order in top of the sixth. In the bottom of the sixth, Wade led off for the Lady Colts with her second consecutive double. Palmer reached on a walk. Felicity Murphy, now pitching for the Colts, stepped in and attempted to bunt to move both runners into scoring position. Schieber would not allow it as a diving catch on the botched bunt led to doubling-up Palmer at first. Gottfried notched a double to score Wade from second and then stole third base. Galion got out of the jam, forcing a groundout to Thomas in the circle to end the inning, with the Lady Tigers up 6-5. Galion would threaten again in the seventh, looking to expand their lead starting with a lead-off double by Clark. Sedmak and Thomas singled to load the bases but no one scored. In the bottom of the frame, Crowner hit her second single of the game with one down and took second on another Zara Thomas single. Crowner was out at third on a fielder’s choice. With two outs, Wade flew out to second to end the contest. Madelyn Thomas earned the win, surrendering nine hits, walking one batter and striking out four. The Lady Tigers Nevaeh Clark trots around the bases after delivering a two-run home run in Thursday’s district finals contest against the Crestview Lady Cougars. 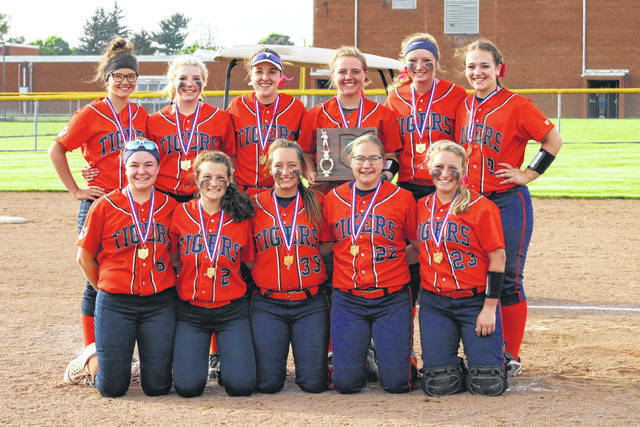 Galion claimed their first district title in over 35 years by defeating Crestview; 4-1. 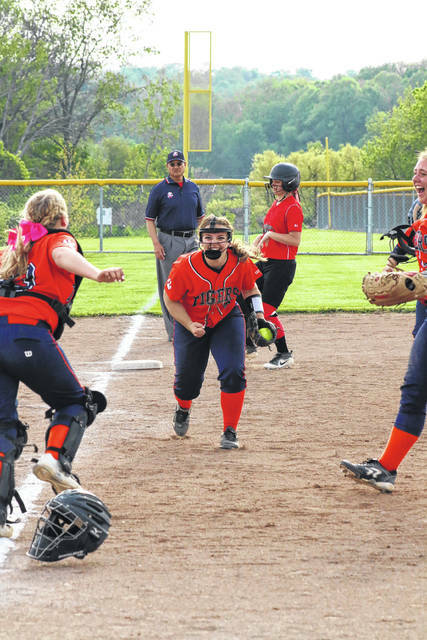 The Galion Lady Tigers prepare to celebrate as third baseman Kate Schieber secured the final out in Thursday’s district finals matchup against the Crestview Lady Cougars. Galion clinched a regional tourney berth by defeating the Cougars; 4-1.